We are excited to announce Open Air Theatre is coming back to Miserden this summer! 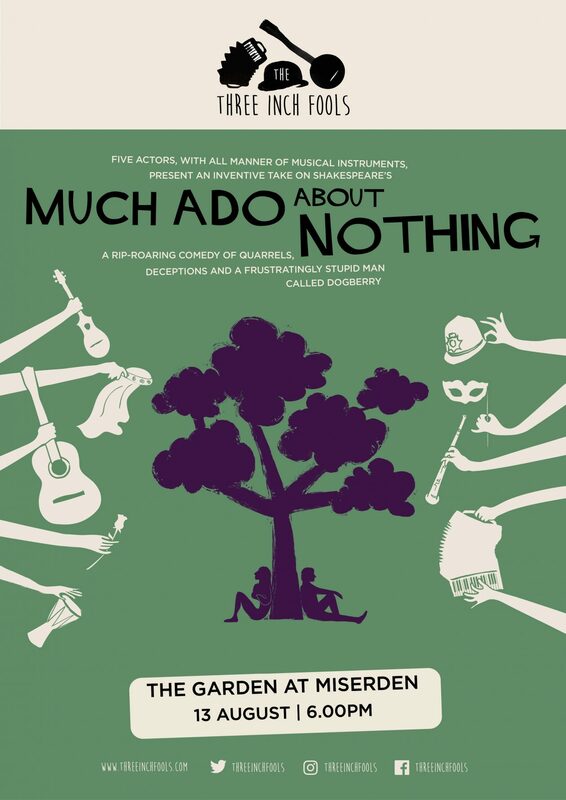 We have 3 fantastic productions in the calendar, all taking place in the beautiful setting of The Garden at Miserden. Five actors, with all manner of musical instruments, present an inventive take on Shakespeare’s Much Ado About Nothing – a rip-roaring comedy of quarrels, deceptions and a frustratingly stupid man called Dogberry. The Three Inch Fools is a five-strong troupe of actors, performing a highly imaginative and vibrantly musical take on Shakespeare’s plays across the UK. The Fools do Shakespeare differently – a fast-paced, musically-driven style, using all sorts of different instruments, plenty of multi-roling and many a quick costume change along the way. Click the button below to buy tickets for Much Ado About Nothing. Being outdoors, please bring your own seating (blankets, camping chairs, etc) and dress for the weather!